Political Capital designed the Demand for Right-Wing Extremism (DEREX) Index using its own theoretical model and data from the European Social Survey (ESS), a biannual study that tracks changes in societal attitudes and values in more than 30 countries in Europe and the Middle East. Our risk-analysis division developed the model, chose the questions, determined subject groupings and set the criteria over the course of roughly one year. We took both inductive and deductive approaches to constructing the DEREX Index. We began with a theoretical model, relying on the ESS questionnaire and correlations between variables to create the sub-indices. We developed the methodology in four steps: 1) Building the theoretical model; 2) choosing the appropriate questions to include from the ESS survey; 3) deciding how to qualify the respondents’ answers to the survey questions; and 4) assigning numerical values to the answers, which allowed us to calculate scores for DEREX and its sub-indices. At the end of the process we also tested the model’s reliability and validity. Our definition of right-wing extremism is thus based upon both ideological and psychological elements. The first three sub-indices (prejudice and welfare chauvinism, right-wing value orientation and anti-establishment attitudes) are inherent parts of extreme right-wing ideology according to practically every author who studied the subject. The fourth (fear, distrust and pessimism) includes emotional factors that typically fuel the first three components, according to previous research. Right-wing extremism is therefore defined by these four qualities; however, we define an individual as a potential right-wing extremist if his answers to the ESS survey questions evince attitudes and ideas that meet the criteria for at least three of the four categories. The questionnaires of ESS consist of permanent and rotating modules. The 2009 round included as many as 285 questions, all of which were multiple choice. DEREX model includes only those questions that ESS surveyors asked in all four rounds. This is the only way to ensure that index values for different years can be compared with one another. These questions are divided into the four categories described above (based on “face validity” and correlational data). These groupings make it possible to examine the different aspects of the attitudes that make up right-wing extremism. We can therefore identify country-specific qualities and characteristics in each of the four categories and develop country groups using cluster-analysis techniques. 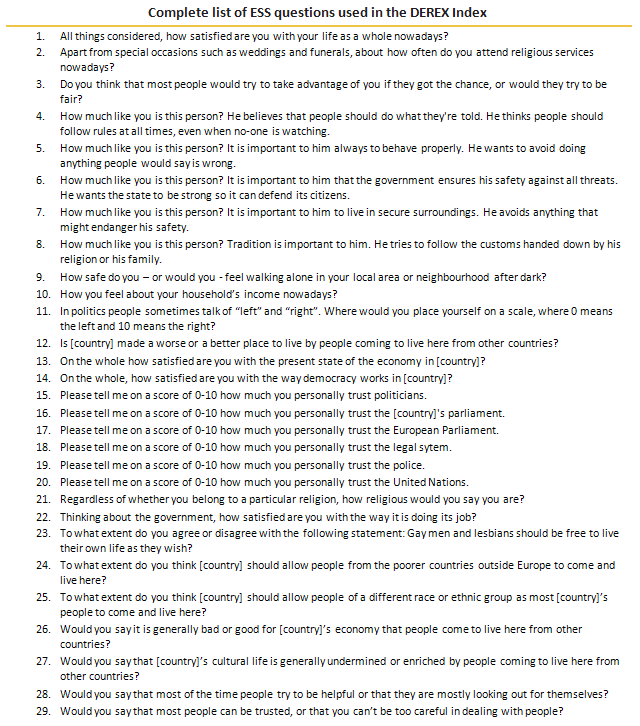 Item level: We determined the answer – or range of answers – to each question that would indicate right-wing radical views. Category level: We then established categories, deciding how many of the above answers a respondent had to give, and in what combination, to qualify as a potential right-wing radical voter. After categorizing the questions and establishing the criteria, we refined each of the four groups through a qualitative examination of the answers’ correlations with each other, as well as the range of possible answers for each criterion. This was based on a subjective assessment by the analysts who developed the index. Using the criteria outlined above, we determined how many respondents over the age of 15 belong in each of the four sub-indices in each country. We then divided the total number of respondents in each country by the number of respondents in each of the four groups. This gave us a numerical value for each sub-index in each of the 33 countries in the ESS survey. A country’s DEREX score is determined by the rate of respondents who belong to at least three of the four categories: for example, respondents who express anti-immigrant sentiments, anti-establishment attitudes and right-wing values all at once. Using these strict criteria, the DEREX Index examines the percentage of people whose extremist views could destabilize a country’s political and economic system – if these views continue to gain credence. Although DEREX is an index, not a scale, we examined the model’s consistency using Cronbach’s Alpha statistic, a scientific indicator that measures reliability using correlational data. All of DEREX’s sub-indices significantly exceed a rate of 0.6 that can be regarded as acceptable, the overall index has a rate of 0.868, demonstrating a strong consistency between the items that compose the index. In other words, both the individual categories in the model and the Demand for Right-Wing Extremism Index as a whole can be regarded as psychological constructs.